James Cromwell’s love of all living things isn’t just a charade he puts on whenever he needs to make a few extra bucks on the Babe convention circuit. In fact, he’s been an activist since the 1960s, when he was a member of the pro-Black Panther political group Committee to Defend the Panthers. These days, Cromwell—who became a vegan on the set of Babe back in 1995—is more involved with animal rights and environmental causes, and has been arrested at protests against everything from animal experimentation at the University of Wisconsin to the building of a power plant in New York State. That latter arrest has led to the 77-year-old actor being sentenced to a week in jail for his role in a December 2015 sit-in, Variety reports. 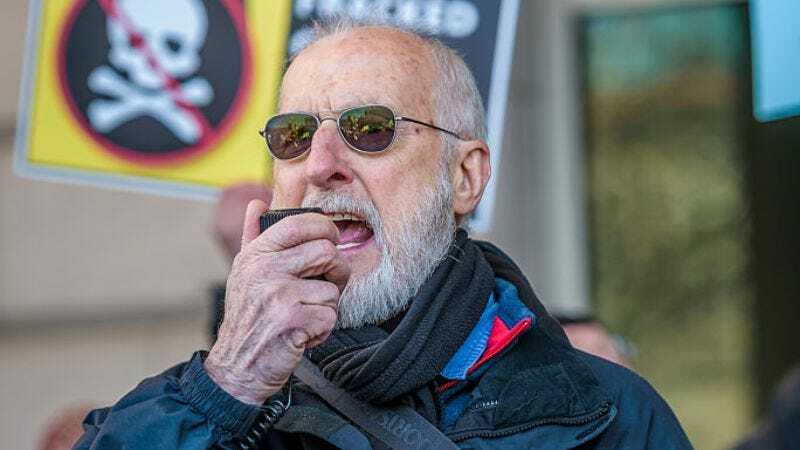 Cromwell was among a group of six activists arrested while protesting the building of a Competitive Power Ventures plant near the small town of Wawayanda, New York, just northwest of New York City. Although fracking is banned in New York State, the group argued, the natural gas-fueled plant would directly encourage fracking in other states, while emitting toxins that would endanger the area’s human and animal residents. Cromwell led a crowd in chanting “power to the people!” before being led away in handcuffs, local paper Times Herald-Record reports. Cromwell and the other protestors were charged with disorderly conduct, issued tickets for $250 plus a $125 surcharge, and released. When the deadline to pay the ticket came up, Cromwell and two other activists refused to pay, leading a judge to hand down the weeklong jail sentence. After an appeal, the deadline has been extended two more weeks; if Cromwell doesn’t fork over the cash by then—and, given that this is a deliberate act of civil disobedience, he probably won’t—he’ll have to report to the Orange County Jail on Sunday, July 14.